This work is the first picture created through Malina’s Système Lumidyne. 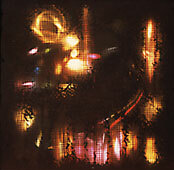 "Frank Malina developed a number of systems in the 1960's to explore dynamic lightforms. The Lumidyne and Reflectodyne were maniplulable kinetic scupltures whic modulated light with a set of rotating painted acrylic disks. Frank Malina was also notable as an historian of kinetic art and as founder of the Leonardo journal of arts and sciences."